This article show you the method to enjoy Tivo files on Samsung smart TV Plex media server. Plex smart TV app enable you to enjoy our gorgeous interface on your screen, available in most smart TV app stores, and access all of your media directly on-screen. The app is available on all 2016 Samsung models that are Tizen-based. The exception is for users located in Brazil, China, or Iran; the app is not currently available for users in those countries. For list all Samsung 2016 Tizen TVs, please visit this page. Then how to watch Tivo files on Samsung TV via Plex media server? In order to watch Tivo files on Samsung smart TV Plex app, you’d better transcode Tivo files to MP4, MPEG, MKV or other smart TV Plex app compatible format. 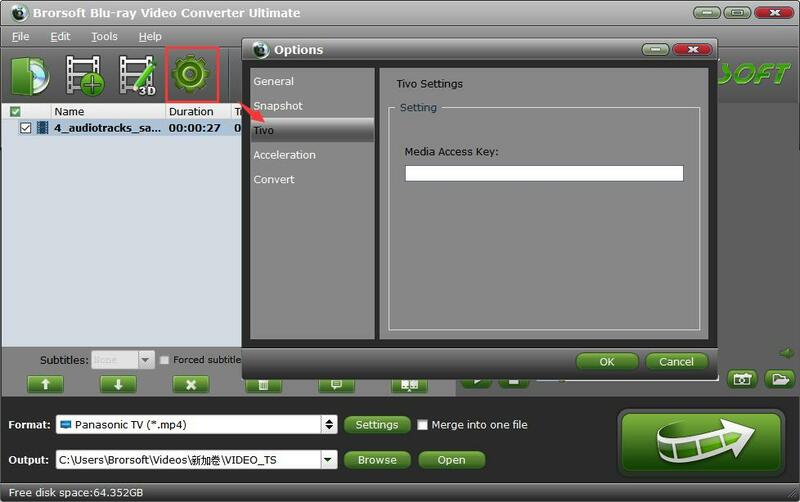 For transcoding TiVo files, Brorsoft Video Converter Ultimate (for Windows) / Brorsoft iMedia Converter (for Mac) should take into your considerations. In fact, this TiVo Converter is an all-in-one video convert app. It can help you quickly and easily convert TiVo to any format like MKV, AVI, WMV, MOV, MPG, M4V, MP4, etc with least quality loss. Besides TiVo, this video convert program can also help to convert between any popular video and audio formats as you need. You could get wonderful output files and never worry about out of audio/video sync. Plus, with the built-in video editing feature of the program, you can trim, crop, add watermark and more to your video files. 1.On your PC, launch TiVo Desktop for PC (click to download), the freeware that transfers shows from your networked TiVo box to your computer. 2.Click “Pick Recordings to Transfer.” A window showing your TiVo box’s “Now Playing” or “My Shows” list appears. 3.Highlight any title in the list to see more information about the show. Check the box next to the title of the show (or shows) you want to transfer. 4.Click “Start Transfer.” Transfer times vary, but may take as long as the show’s duration to complete the transfer. Download the free trail version of Brorsoft Video Converter Ultimate / Brorsoft iMedia Converter, just keep in mind that you have download the right version, Mac OS .dmg files cannot be installed on Windows platform – and vice versa. Launch TiVo Converter, press “Option” icon first and enter TiVo Media Access Key to “Tivo” tab. Then hit the “Load file(s)”icon to import TiVo recorded videos to this TiVo converter. Since the app supports batch conversion so you can import more than one TiVo recordings at a time. Go to “TiVo Central” menu >> “Messages and Set Up” >> “Account and System Information”, and you will see your Media Access Key there. If you plan to re-encode Tivo to smart TV plex app with more compatible format like MP4, just navigate to “Format” > “HD Video” > “H.264 HD Video (*.mp4)” as output file format. Just click “Convert” button to start to transcode Tivo to smart TV plex app supported format. Once the conversion ends, you can locate the MP4 files in output folder. Once the conversion is finished, click “Open” to quickly find the converted movies. Then you can transfer the converted Tivo files to your Plex Media Server or Hard drive for play with Samsung smart TV Plex app. How to Stream Videos to Roku using Plex?